"I have been intentionally vague in this review so as not to spoil any surprises. That being said, it's a fun story with a good mystery..."
What Does My Office Look Like? It’s never a bad idea to go with your strengths, whatever the endeavour. A few years ago, Alexander Galant did the historical research for the novel Dracula the Un-dead, which became a 2009 New York Times bestseller. So when the Meadowvale resident decided to try his hand at writing a novel himself, he naturally drew on those skills. The result is Depth of Deception, which combines history, mystery and murder. Virtual Book Tour begins today. 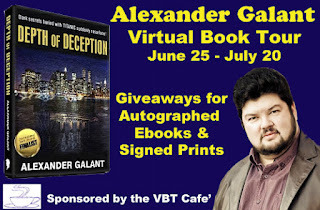 The book tour for 'Depth of Deception' with VBT Cafe Blog begins today. I think anyone who has tried their hand at writing has experienced the Dreaded Writer's Block at one time or another. It's frustrating and annoying. You want to be productive! 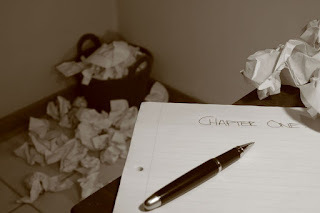 You want to finish a chapter but at the end of day you didn't even make it through the first sentence on a new page. You wish you could turn it on like a tap but not even a single idea drips out. And you really feel like the talent-well has dried up inside you. There have been many other blogs and sites by other writers offering some practical advice to combat the dreaded writer's block. I think every writer is different. We all have our different styles and what works for one writer may not work for others. I wanted, instead, to share my recent bout with writer's block because the outcome was not what I expected. As I published my debut novel, Depth of Deception (A TitanicMurder Mystery), I knew what the next novel was going to be. In fact there is a preview Prologue and first chapter of Bloody Mary Kelly at the end of Depth of Deception. I have already written the first 12 chapters and the conclusion. This may sound odd but it's a quirk of mine that I always write the last chapter first, then go back to the beginning and work towards that end. Thus, laying down the foreshadowing and plot-twists wherever needed is easier. Bloody Mary Kelly was going to be set in two time periods: present-day Toronto and Victorian London. I had amassed a ton of research materials, including detailed maps of Victorian London, copies of Scotland Yard files, etc. I was recently at the Bloody Words writer's conference in Toronto, where I not only spoke on a panel for Historical Research in mystery novels, but attended other panels by a police detective and a forensic psychologist who answered some questions I had for the new novel. Armed with all of this information I was ready to continue working on Bloody Mary Kelly. I sat in front of the computer. Read over my notes. Read over the outline. I knew what was supposed come in the next chapter but I couldn't write it. Something didn't ring true. A major character that I was about to introduce didn't seem to work. Did I need to change their profession? Their gender? (I've done that before while writing a story.) Nothing seemed to work. I was really stuck. This major character would be need to be weaved throughout the story, so I couldn't jump ahead, or cut them out entirely. What to do? This went on for more than a week, and I was getting frustrated. Not feeling well, I took a nap in the middle of the day, which is something I only do if I'm sick. You know how they say if you're thinking of a problem as you drift to sleep, the answer will come to you? Well that's exactly what happened. I woke up and I had it. Unfortunately, the answer wasn't for Bloody Mary Kelly at all. An idea that I had back-burnered five years ago, which didn't have a thought-out plot or conflict, (can't have story without either of those!) suddenly made sense. I woke up from my nap with the plot in my mind. I sat up, reached for my iPhone and began surfing for some historical information right away, to make sure it was going to work within the time period. Not only did it fit the timeline but I started to find other historical events that gave me the conflict that was missing from the original idea. Suddenly I had the ending of my novel! I went to my computer, wrote the conclusion and from there the opening of the story was clear in my mind. This new story lay itself out for me, needing to be told. You can't turn it on like a tap, nor can you control it when it erupts like a geyser. I've decided to ride that inspirational wave and put Bloody Mary Kelly on the back burner (for now). Why argue with the creative flow? So I'm starting a different new novel which, ironically, opens with our protagonist suffering from writer's block.